Interesting Facts: Machoke appear as larger, tailless Machop with red marks along their muscular arms. Their faces are more reptilian than before. The marks actually look like places where the skin has stretched apart because it can barely contain its huge muscles. 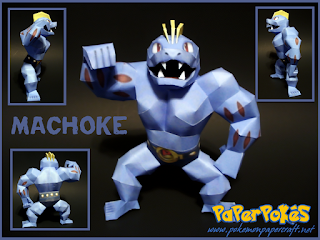 Machoke wear black wrestling tights for better movement and a large, golden belt with a little red P on the buckle. NOTES: Build from the head down. Cut notches for the crests in the head. Attach the arms, moving downward, and close at the bottom of the legs. How do the yellow things on top attach?